Every class, every day, a student demonstrating the best effort in class will be awarded the Tiger Ticket. A Tiger Ticket will be drawn at each test to win the Prize of the Month displayed over the water fountain. At every regular testing event, a student is chosen from each belt group to receive the Best Test Trophy for the demonstration of courage, power, control, positive attitude and perseverance. The Best of the Best Testing Medals are awarded at regular testing events for students exhibiting “Best Sparring” skills, the “Best Kick”, the "Best Breaking” and the “Best Form.” A set of medals is awarded to both the low rank wave and the later high rank wave. In order to be eligible to test to the next level, school age children must submit their latest school report card. Students with excellent report cards will receive an Academic Achievement Certificate and a Label Pin to place on their sparring bag or jacket. The SOY, or Student of the Year is selected in the fall and presented the Student of the Year plaque at the November testing. The recipient is chosen by years of dedication, outstanding attitude, leadership and their mentorship to their junior ranks. Kids, keep up on your reading during the summer school break. Turn in your Reading Log each month with your list of books read. White Tiger will issue you a paycheck of Taekwondough that you may spend in the pawshop to purchase T-shirts, hats, targets, etc. White Tiger hosts several tournaments every year, one in particular is just for Tiger Tots. Our Tiger Tot students range in age from 2.5 to 5 years old. Competitors will perform a roll on the wedge mat, demonstrate their kicks and punches on command and break a board! All competitors will receive a medal for their courage and good sportsmanship. For students who enjoy the contact aspect of Taekwondo, the annual Sparring Tournament is for you. 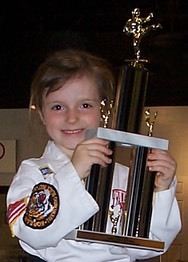 Competitors of all ages, from beginners to International Champion level will compete for trophies. For students who enjoy the technical execution of Taekwondo, the annual Poomsay Tournament is just for you. Taditonal forms, musical forms, creative forms and team forms will compete for medals or trophies. Are you really fast? Can you jump really high? Are you extra flexible? Do you specialize in weapons? 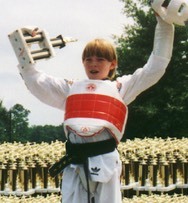 The White Tiger Olympic Tournament is a unique tournament that showcases special skills. Choose from 12 different divisions, enter as many times as you wish. Free, fun tournament experience for everyone during the winter holidays. Like to travel to compete? We have that. White Tiger not only has local, national and international Champions, we have Internationally Certified Judges, Coaches and Referees too. Food for the Koi fish is pre-measured each day. 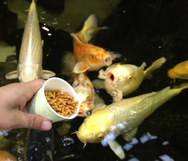 Instructors will select the students who demonstrate the most respect to feed the fish. Tiger Tokens may be earned for completing various tasks like inviting chingoos, earning stripes, etc. The Tokens may be used instead of money, to purchase specialty items found in the store. Taekwondough money can be used as real money at White Tiger to purchase supplies and merchandise. You may use Taekwon-dough money for up to 50% of the purchase price. 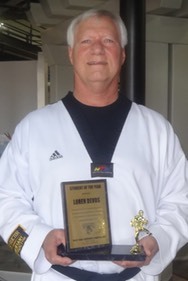 Students can earn Taekwondough for outstanding effort and by participating in special programs such as the White Tiger Reading Program, and for earning a stripe on their belt. Every month an outstanding student is selected from each belt rank as “Belt of the Month”. The student will receive Taekwondough money and a certificate. Every month White Tiger will recognize a student for their improvement, achievement, attitude, attendance and respect of the Martial Arts. The Student of the Month will be featured in a full color poster displayed at the school in the lighted marquis. 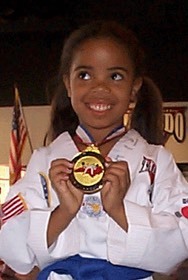 The student will receive a certificate, Tiger Tickets and $5.00 in Taekwondough. The poster will be displayed for the month, and then it is theirs to keep. A family that kicks together sticks together. This award is in recognition of family members keeping physically active, striving for goals and making healthy choices together. 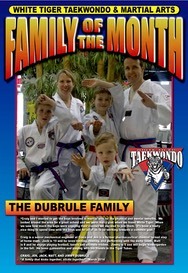 A family is featured each month with a poster displayed in the marquis box and a certificate. Every class, every day, the instructors award Tiger Tickets for outstanding effort and behavior. The Tiger Tickets are placed in the bowl and a winner is chosen at Testing. Local companies donate the prizes. The prizes vary, but are at least $100 minimum value. Some prizes are much, much bigger. 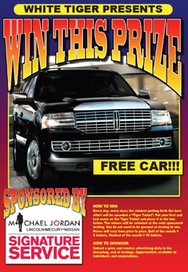 Thank you to Michael Jordan Lincoln, Mercury, Nissan!